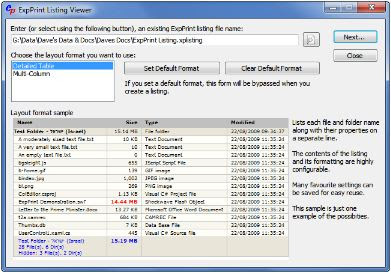 ExpPrint is a directory listing utility that integrates with Windows Explorer, allowing you to view, print, and save listings of files, directories, and virtual folders. - New for V5. Photo, Video, Music, & Document file tags/properties. - Output any combination of Name, Size, Type, Time values, version, CRC32, MD5, SHA-1 hashes, and other file properties. - Flexible typographic styling capabilities. Colour, font face and size, and spacing are some of the things that are configurable for each section of a listing by editing style sheets. A collection of styles is provided which shows many of the possibilities. - Flexible indentation formatting for hierarchic subdirectory listings. - XML/HTML output provides viewing, print and print preview capabilities (through your Internet browser), and can often be loaded into other applications. - Should you need additional flexibility, the open XML based technology architecture allows for more comprehensive customisation and custom applications.